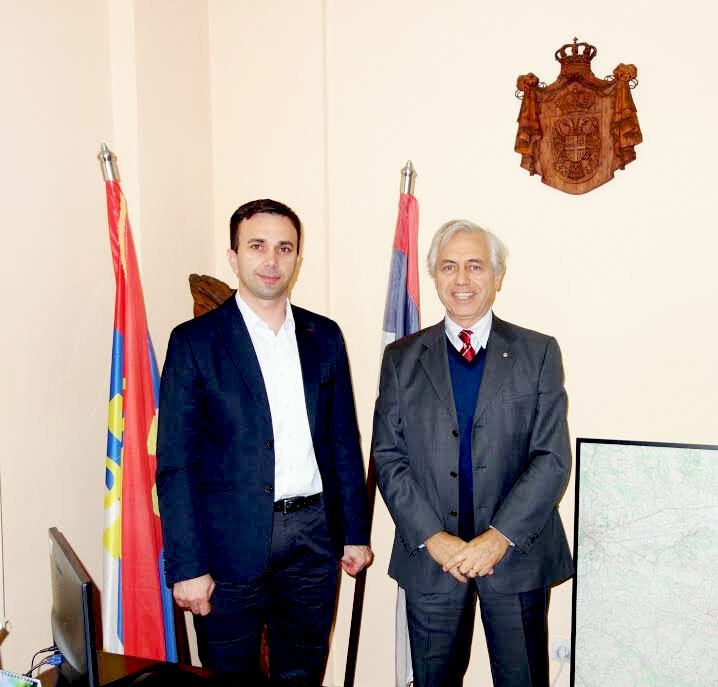 The collaboration of the Mayors for the project "Make a WISH to the Sovereign Order of Malta"
In Serbia there could not have been a better day to start the collaborations with Mayors of the areas affected by floods, for the launch of the project “Make a WISH”. 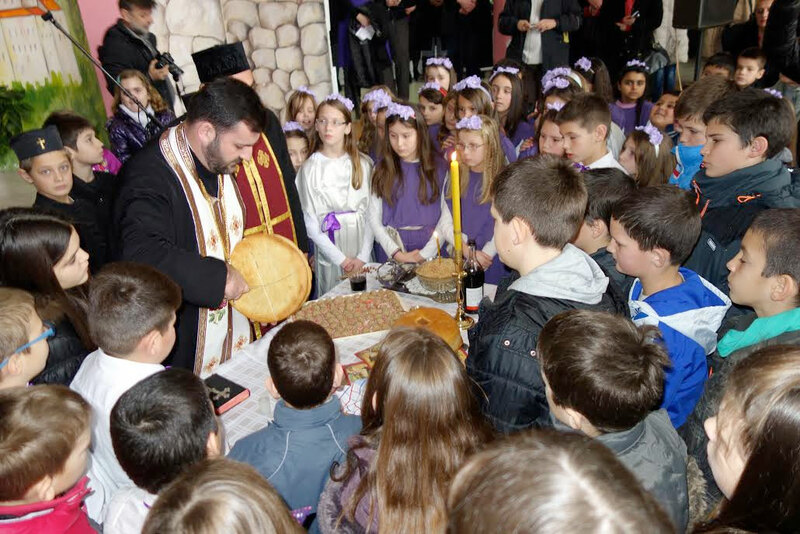 Today is in fact Saint Sava, the patron saint of schools, and at Mionica the Ambassador of the Sovereign Order of Malta, Alberto di Luca, was warmly welcomed by the Mayor Boban Janković and a school in the middle of festivities very happy to be introduced to the modalities of participation to the project “Make to WISH “. 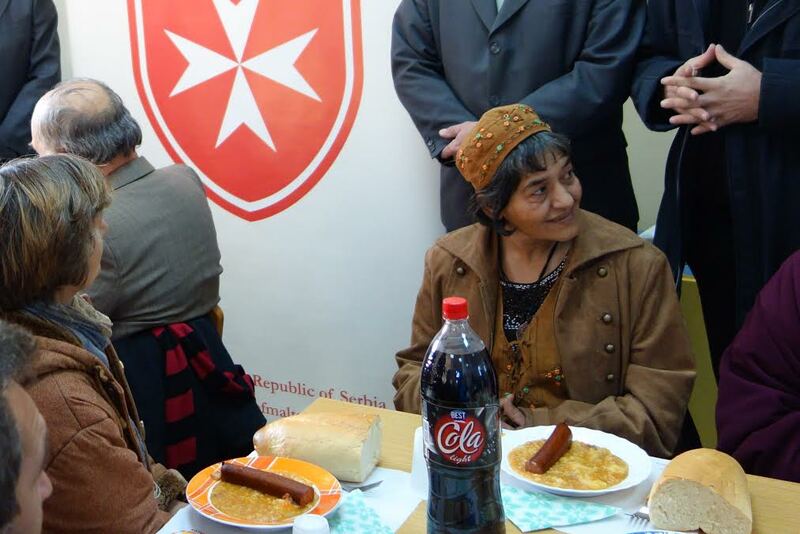 Repeated this year, "A hot meal on a cold winter’s day"
This 2015, the Embassy of the Sovereign Order of Malta in Serbia will again be alongside those in need of “a hot meal on a cold winter’s day”. Together with the logistical collaboration of Caritas Serbia, every weekend during Serbia’s cold winter, at Aleksinac and Sabac, the initiative that satisfied more than 3,000 people last winter of 2014, will be repeated. 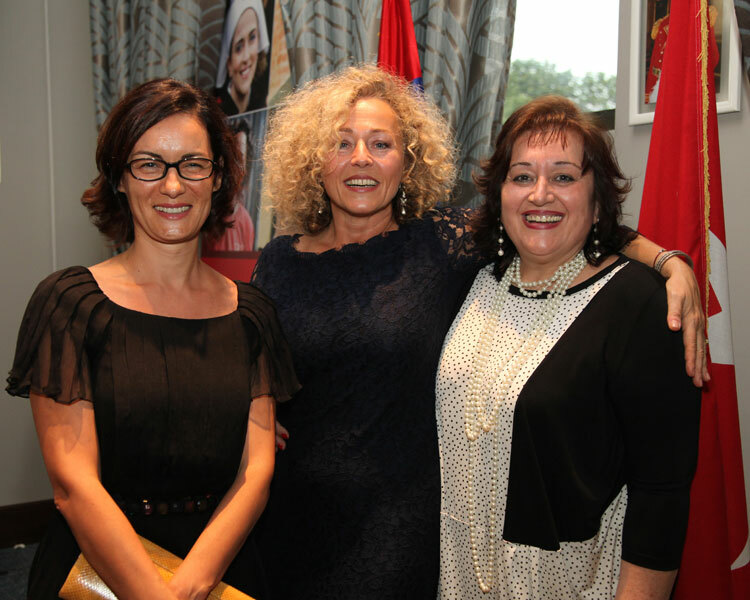 The Embassy of the Sovereign Order of Malta in Serbia, delivered, last October 30th, the anticipated humanitarian aid to the association against childhood diabetes in Kragujevac. To do the greetings, next to the president of the association, Borko Marinković, was present as well the Mayor of Kragujevac, Radomir Nikolić. On that day were delivered by Ambassador Alberto di Luca, kits for measuring blood glucose levels, laptops, toys and clothes for children. 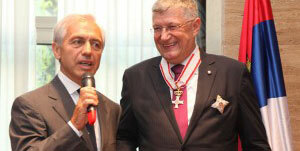 On that occasion, the association expressed the wish to possibly receive more help from Milan. 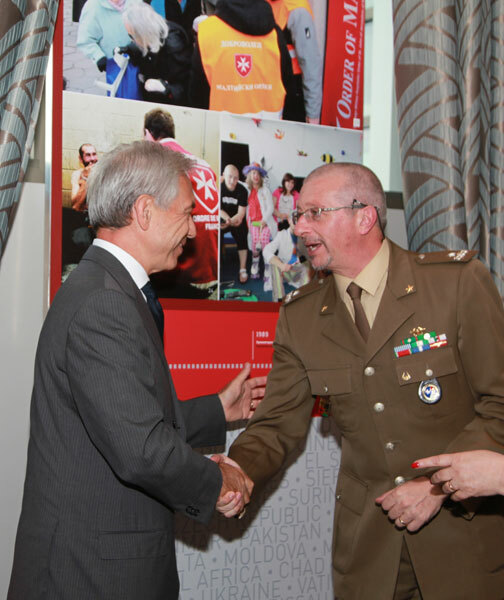 With the cooperation between the Lombardy delegation of the Sovereign Order of Malta , the Italian supermarket chain “Esselunga”, and thanks to the funds raised at the charity event organized last June in Milan, by Meritalia and Zepter International – in cooperation with the Embassy of the Sovereign Order of Malta in Belgrade – the significant costs of transport and customs clearance, for this great load, have been covered thus making possible the delivery before Christmas of food, clothing and products for personal hygiene. MAKE A WISH TO THE SOVEREIGN ORDER OF MALTA is a project aimed at children, residing in the flooded areas (District of Braničevo: Municipality of Kostolac; District of Mačva: Municipalities of Mali Zvornik, Krupanj, Loznica, Ljubovija, Vladimirci, Koceljeva i Bogatić; District of Srem: Municipality of Šid; District of Pomoravlje: Municipalities of Svilajnac, Ćuprija, Paraćin, Rekovac; District of Kolubara: Municipalities of Ub, Lajkovac, Ljig, Osečina, Mionica; District of Morava: Municipalities of Lučani, Gornji Milanovac; District of Šumadija: Municipalities of Rača, Knić, Topola; District of Zlatibor: Municipality of Kosjerić; District of Bor: Municipality of Majdanpek) from Serbian elementary schools (from grades one to eight) to have the opportunity to see the realization of their dreams and desires: a WISH. 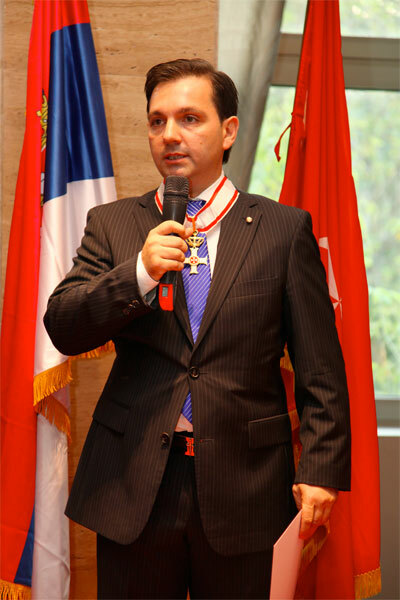 The candidates, to participate, must send a letter signed by their parents (or legal guardian) or the attached application form with their WISHES to the Embassy of the Sovereign Order of Malta – Krunska 23A, in Belgrade– from December 13th 2014 to March 13th 2015. The Embassy will submit to the Commission the admissible WISHES, which will, according to the available budget, select those that are economically sustainable and practically achievable, and insert them in a short list. 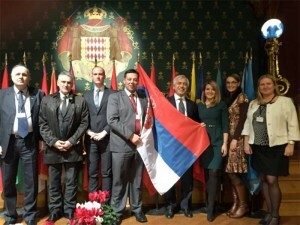 To this first list, will also be added the WISHES that, for costs or organizational reasons, are not immediately achievable; these WISHES will be brought to the attention of donors or sponsors in Serbia, Italy, France and Monaco or any other country, for a possible willingness to support its costs. A final list will be then obtained and closed on September 13th 2015. 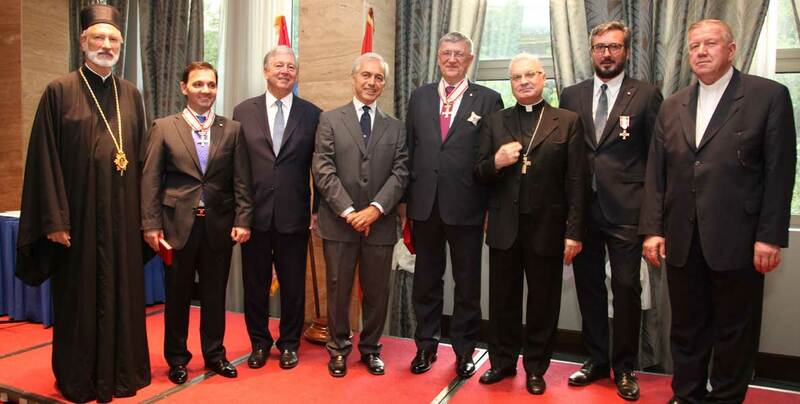 The Commission will have the final draft of the accepted projects and will inform the Embassy of the Sovereign Order of Malta which will in turn inform by official letter the “qualified”. 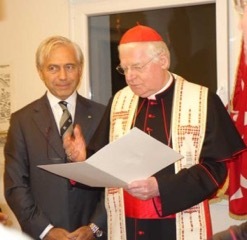 The official handover ceremony will take place at (location to be defined) on October 13th, 2015, – Feast of Blessed Gerard, Founder of our Order of Malta. 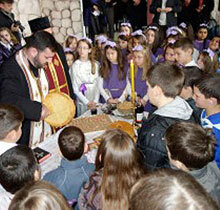 The WISHES can represent a dream, an aspiration, a desire or a specific need of the young candidates. 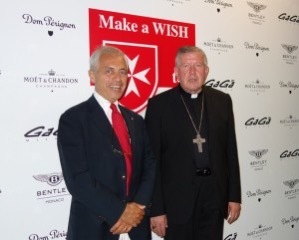 Every WISH has to be compatible with the Mission of the Sovereign Order of Malta to help mainly those who suffer or those who have basic needs for a decent life. There are no limits, sizes or default scopes, if not the reasonable possibility of realization with both affordability and organizational boundaries. For example, you can dream and propose “a trip to the Moon with a Knight” as a WISH, but it will be impossible for the Commission to accept this kind of desire! The Commission will evaluate the projects according to the following six categories of WISHES: “receive special medical care”, “do something”, “enhance artistic and cultural skills”, “meet a famous public figure”, “receive an object”, and “go to a specific place”. The Commission reserves the right to choose and select the WISHES to its discretion in base of its admissibility and evaluation of adequacy. Priority will be given to WISHES of humanitarian and medical nature or particularly creative breaks from children with major social problems. Every letter or application form submitted to the Commission, must be signed by the parent or legal guardian. The maximum length of description of the WISH will have to be up to 50 words. Letters without full name of the child, date and place of birth, names of parents (or legal guardian), address, contact telephone, and name and address of attended school, will not be admitted. Will be appreciated, if possible, an email address. 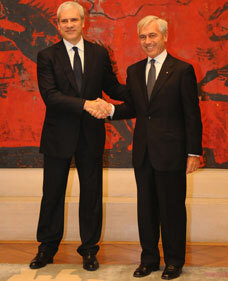 Ambassador Alberto di Luca, as President of the Commission. Media partners: Politika and Pink TV. 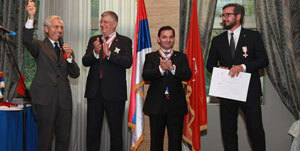 During a long and cordial meeting that took place at the Royal Palace in Belgrade, Ambassador Alberto di Luca has presented to the Prince Alexander II – Confrere in the Order of Malta for over 30 years with the highest rank reserved for heads of European Christian Dynasties – the project especially designed for the children from the tragically hit flooded areas of Serbia from last spring. 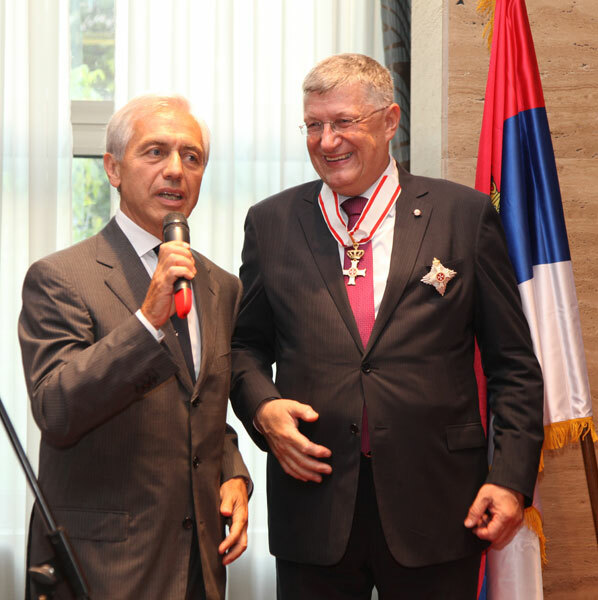 In an atmosphere of friendship and cordiality, Ambassador Alberto di Luca has received, at the Embassy of the Sovereign Order of Malta in Belgrade, Mr. Borko Marinkovic, President of the Association against Childhood diabetes in Kragujevac. After the devastating floods that hit Serbia during the recent months, many diabetes patients, most importantly children, have found themselves in serious difficulties due to the lack of medical supplies. 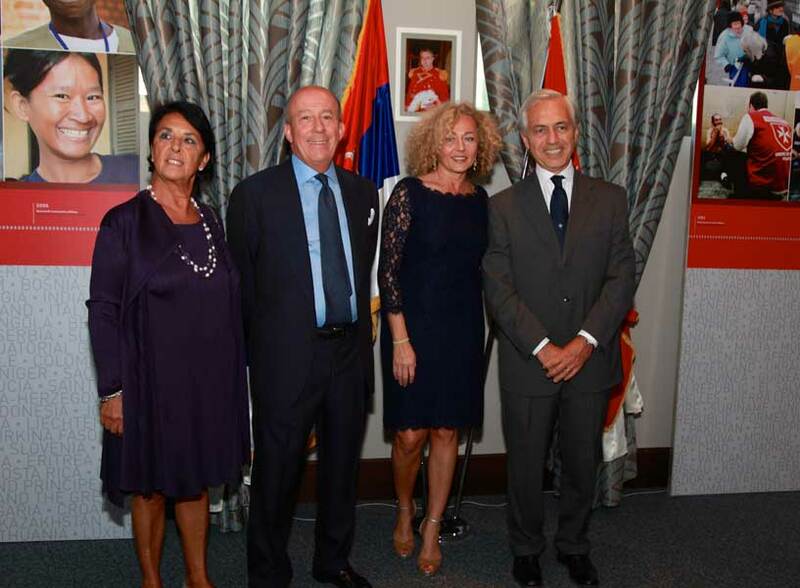 The President Marinkovic explained the initiatives promoted by the Association, in particular those that bind children with diabetes to sports. The Association was, and still is, faced with many difficulties after the floods. Ambassador di Luca was made aware on the organizational arrangements put in place to compensate for the lack of medical supplies, devices, tape, needles, insulin and oral medications, as well as on the problems of finding them and then distribute them to the children of the affected areas. 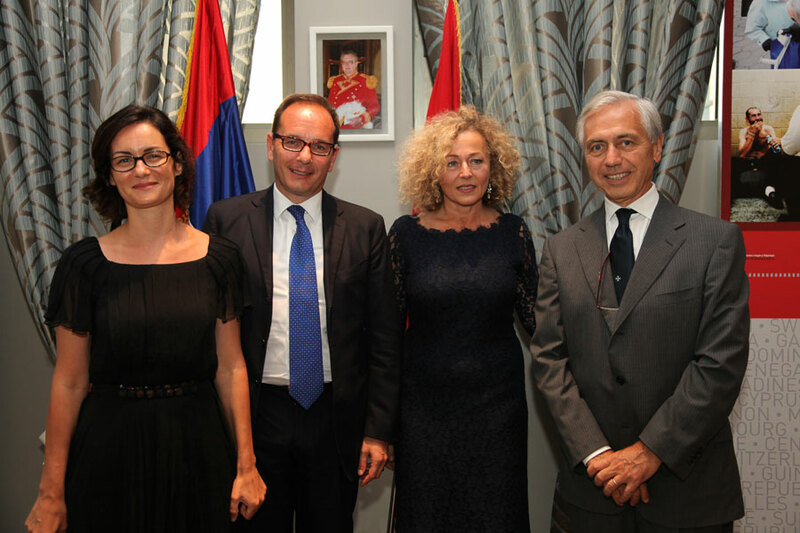 During the meeting, projects were discussed for the upcoming Diabetes Day of November 14th, and possible forms of cooperation to be implemented with the support of Italian or French benefactors. 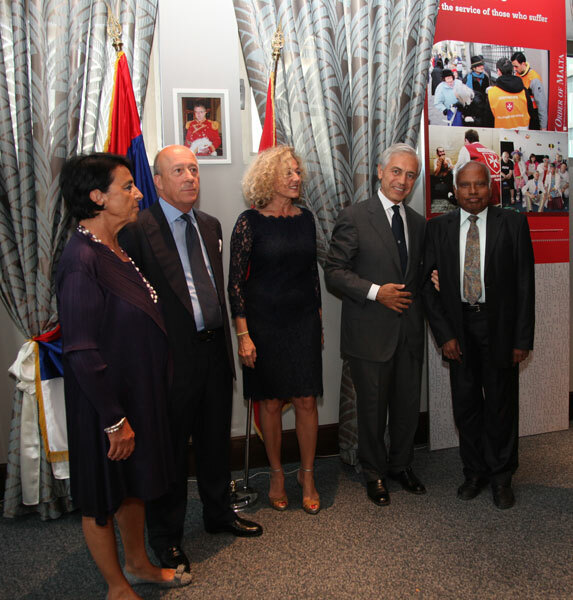 To give a first concrete aid to the Association, for the purchase of “Kits” urgently needed, the funds raised during the charity event organized in Milan, last June, from Meritalia and Zepter International in collaboration with the Embassy of the Sovereign Order of Malta in Serbia, have been addressed to them. 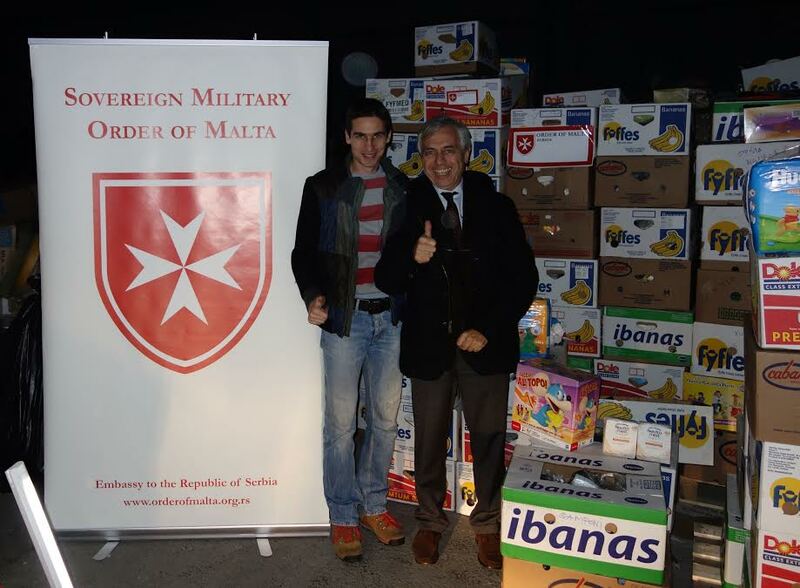 Thirty boxes of jeans, clothing and jackets, that the Piedmontese Delegation of the Sovereign Order of Malta sent a few days ago in Serbia, were then loaded and taken from the Embassy in Belgrade to the Home for Children and Youth with Disabilities “Sremcica”. This Centre, which houses orphans with disabilities, has a constant need for help that the Order of Malta, whenever possible, tries to meet, having provided over time Computers, craft materials for the training of its young guests, supplies and clothing. 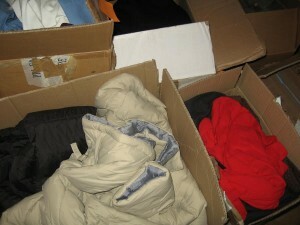 Particularly, in this difficult post-floods and providential moments were considered items like winter jackets in anticipation of the very cold winter in that area. At the Ministry of Foreign Affairs, the new head of the Department for Neighbouring and South-East European Countries, H.E. 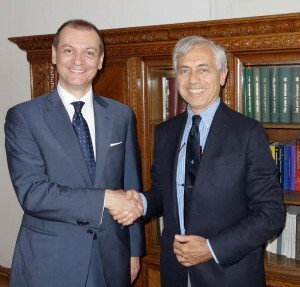 Ambassador Slobodan Vukcevic, received Ambassador Alberto di Luca for a courtesy visit. 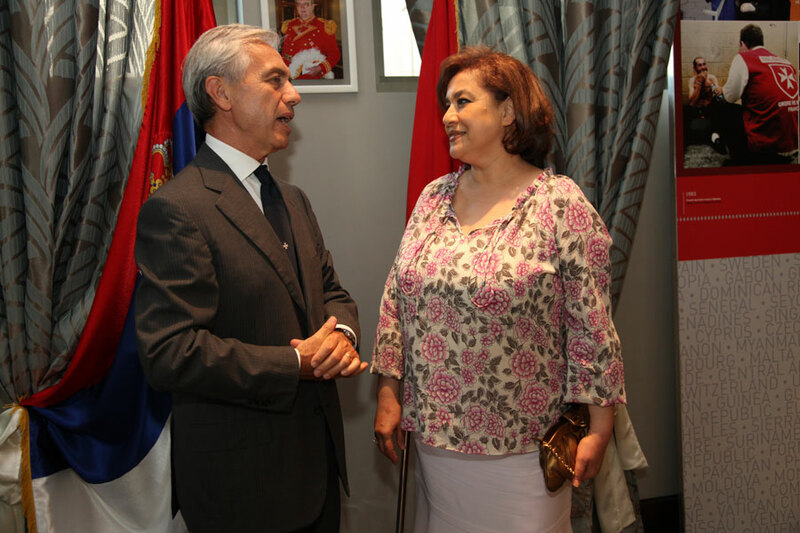 During the meeting, in addition to mutual introductions, they discussed about current issues; with, in the foreground, the flood emergency and the gracious words of gratitude from the Government of Serbia to the Sovereign Order of Malta for its help. 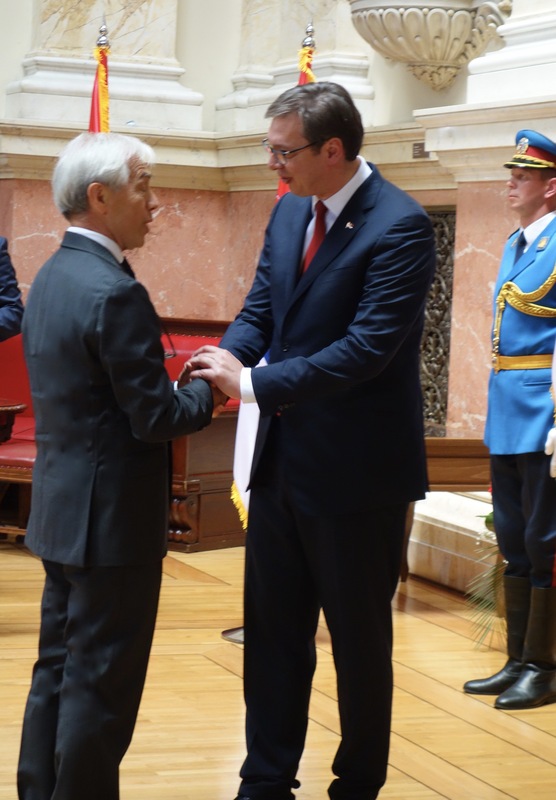 Was also addressed the issue of a possible implementation of the Humanitarian Cooperation Agreement between Serbia and the Sovereign Order of Malta. 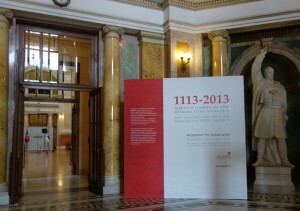 On the occasion of the National Day of St. John, the Embassy in Belgrade of the Sovereign Order of Malta, wanted to bring together at the modern and efficient setting of the Hotel Metropol, over three hundred people among which major institutional, religious, diplomatic and cultural authorities of the Serbian capital. 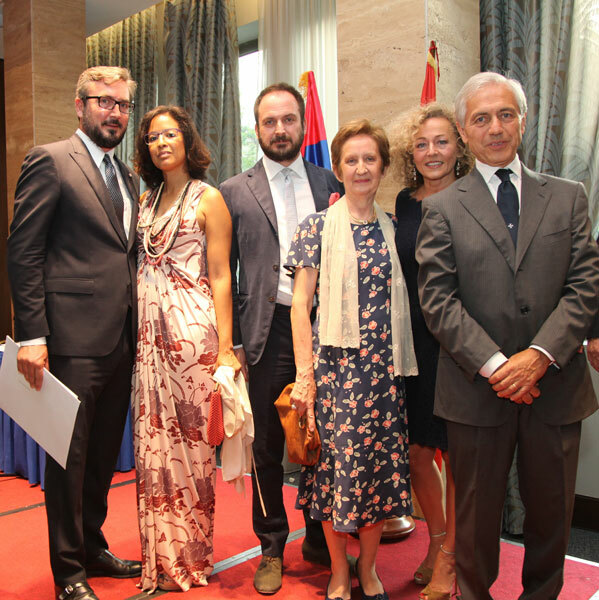 The maximum institutional authorities were highly represented by the Advisor to the President of the Republic, Professor Oliver Antic. The Royal Family was present with H.R.H. 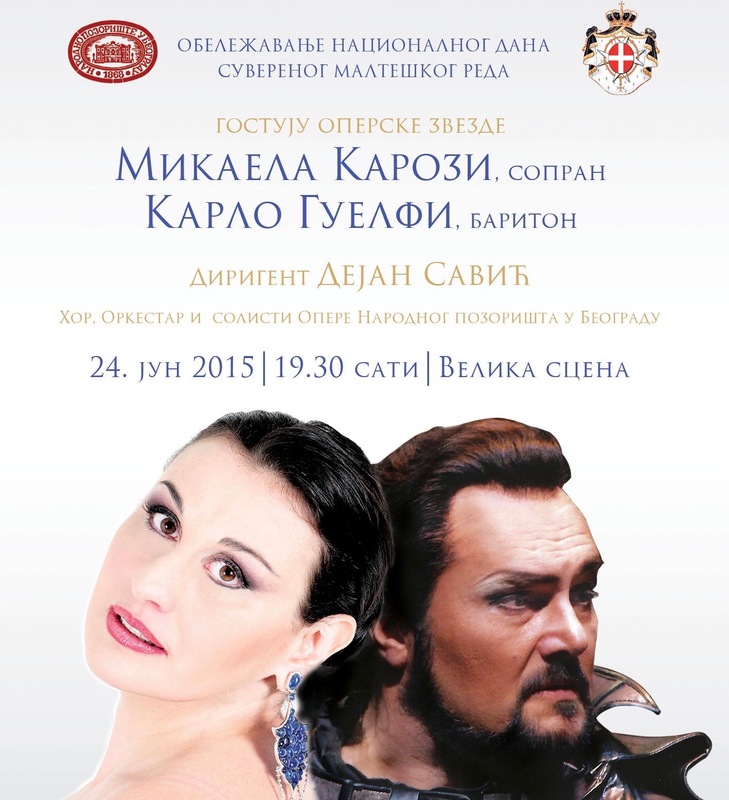 Prince Aleksandar II Karadjordjevic and Princess Katarina. 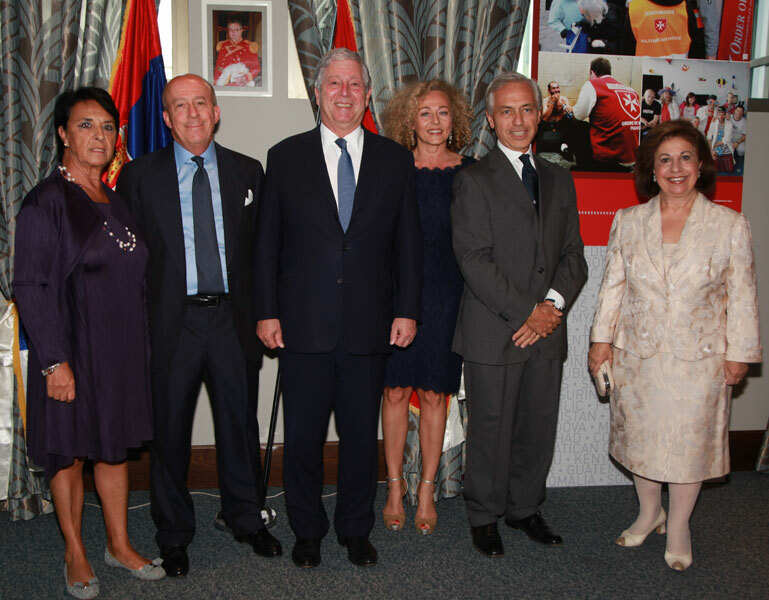 A number of MP’s present, including the Chairman of the Group of friendship Serbia – Order of Malta and National Assembly Deputy Speaker, Prof. Dr. Vladimir Marinkovic. 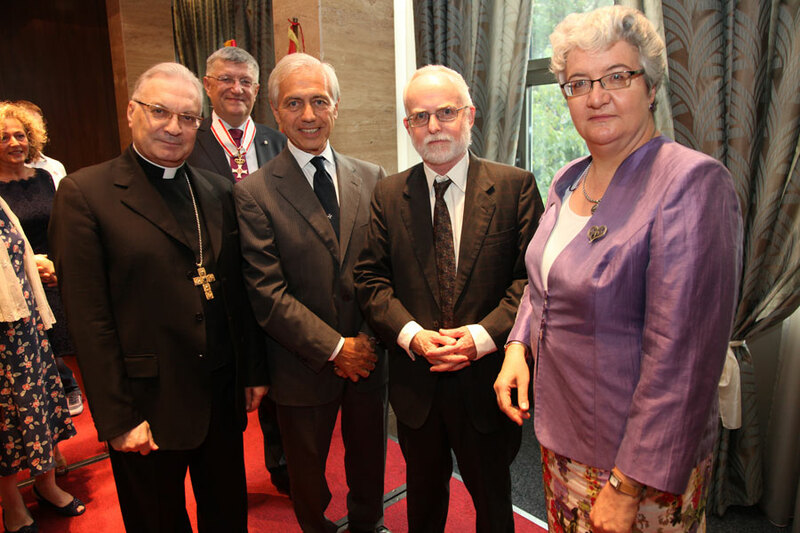 The religious authorities were at their highest levels with the presence, for the Catholic Church, of the Archbishop of Belgrade, H.E. Msgr. 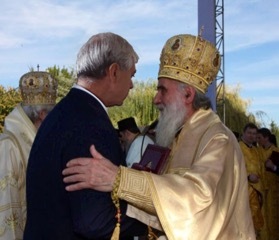 Archbishop Stanislav Hocevar and for the Orthodox Church, with H.E. 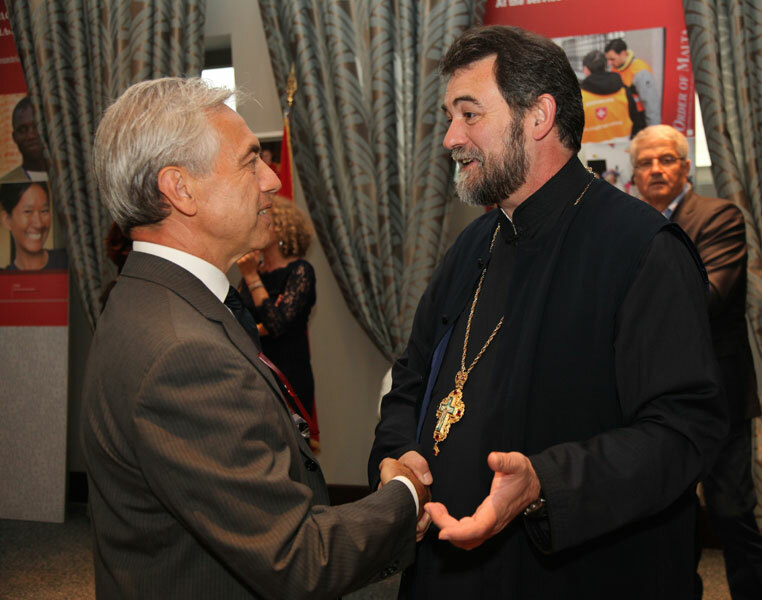 Metropolitan Irinej Dobrijevic with the Archpriest Dr. Luka Novakovic. 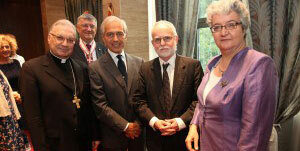 Several diplomats representing their countries: for the Holy See the Apostolic Nuncio H.E. Msgr. 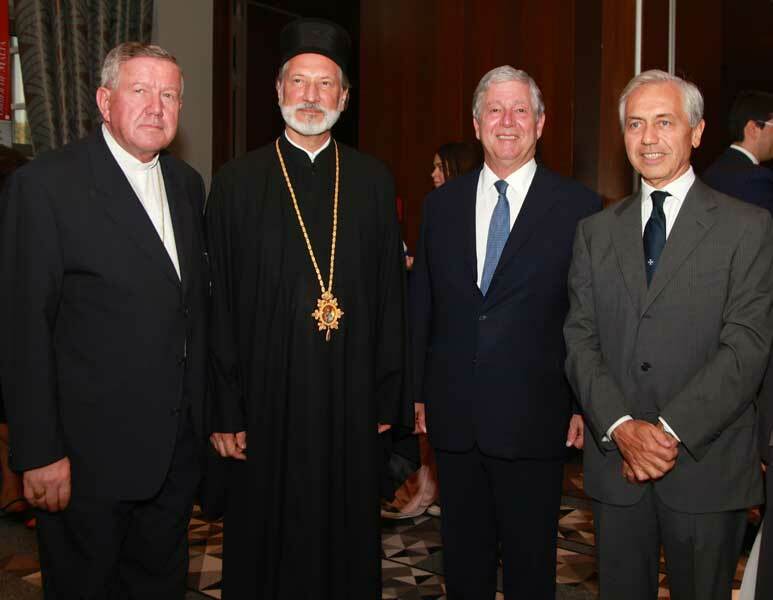 Archbishop Orlando Antonini and the Second Secretary Janusz Stanislaw Blachowiak, Mr. Guiseppe Manzo, Ambassador of the Republic of Italy, Mr. Ernal FILO Counsellor Deputy Head of Mission of the Embassy of the Republic of Albania, H.E. Mr. Toko Diakenga Serão, Ambassador of the Republic of Angola, H.E. 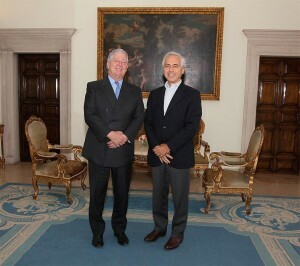 Mr. Ricardo Fernando Fernández, Ambassador of the Argentine Republic, H.E. 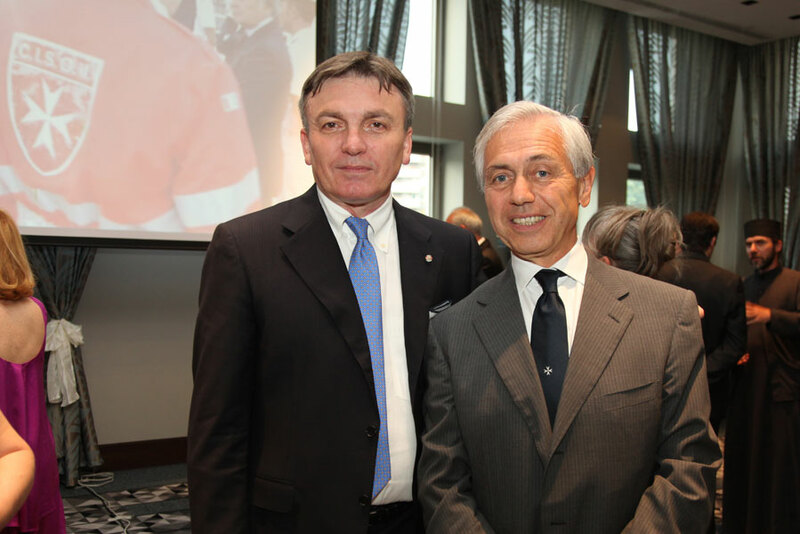 Mr. Vladimir Chushev, Ambassador of the Republic of Belarus, H.E. 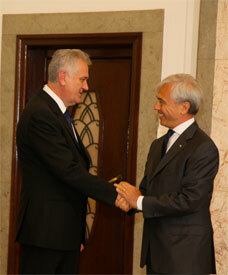 Mr. Leo Vincent M. D’AES, Ambassador of Belgium, H.E. 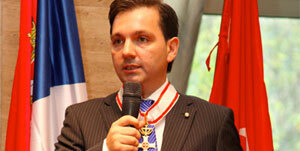 Mr. Ranko ŠKRBIĆ, Ambassador of Bosnia And Herzegovina, H.E. 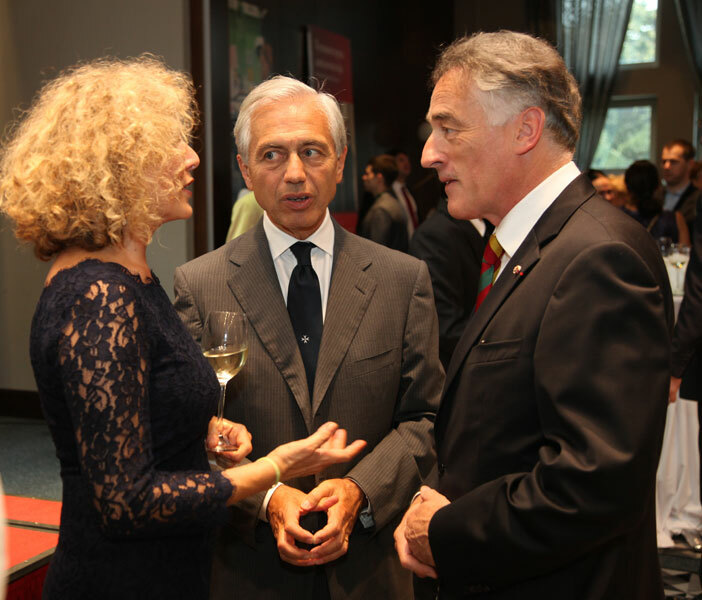 Mr. Sergio Luis CANAES, Ambassador of the Federative Republic of Brazil, H.E. 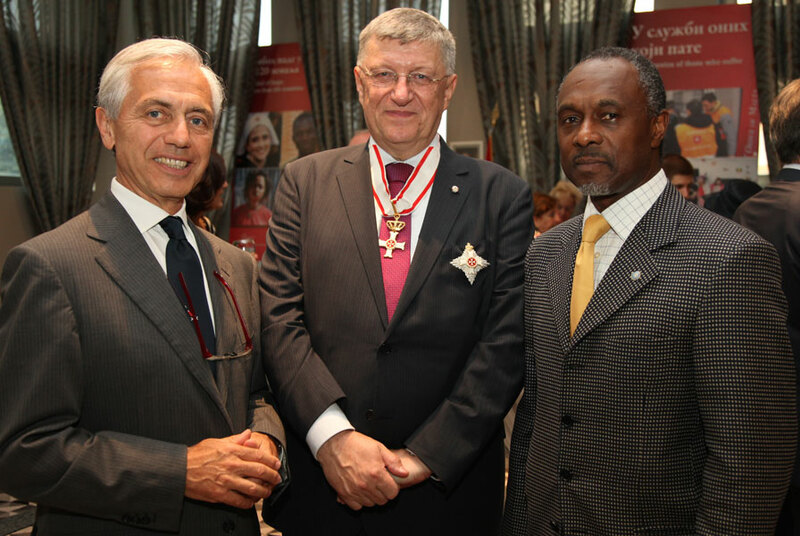 Prof. Dr. Angel Simeonov Dimitrov, Ambassador of the Republic of Bulgaria, Dr. Paul-Emile Tshinga Ahuka, form the Embassy Of The Democratic Republic of the Congo, H.E. 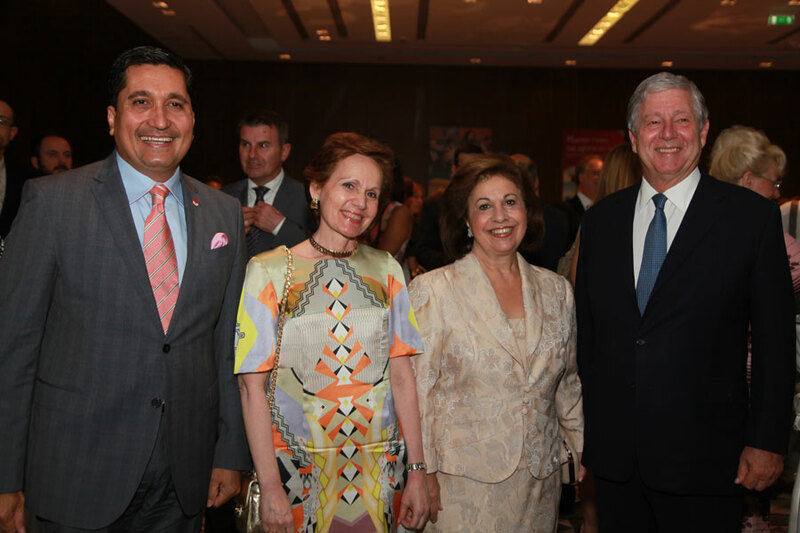 Mrs. Adela Mayra RUIZ GARCÍA , Ambassador of the Republic of Cuba, H.E. Mrs. Ivana HLAVSOVÁ, Ambassador of the Czech Republic, H.E. 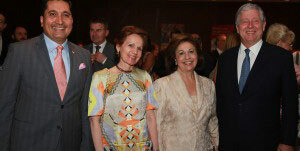 Mrs. Menha MAHROUS BAKHOUM, Ambassador of the Arab Republic of Egypt, H.E. Mr. François-Xavier Nicolas Marie Deniau, Ambassador of the Republic of France, Mr. Almamy Kobélé KEITA Chargé d’Affaires of the Embassy of the Republic of Guinea, H.E. 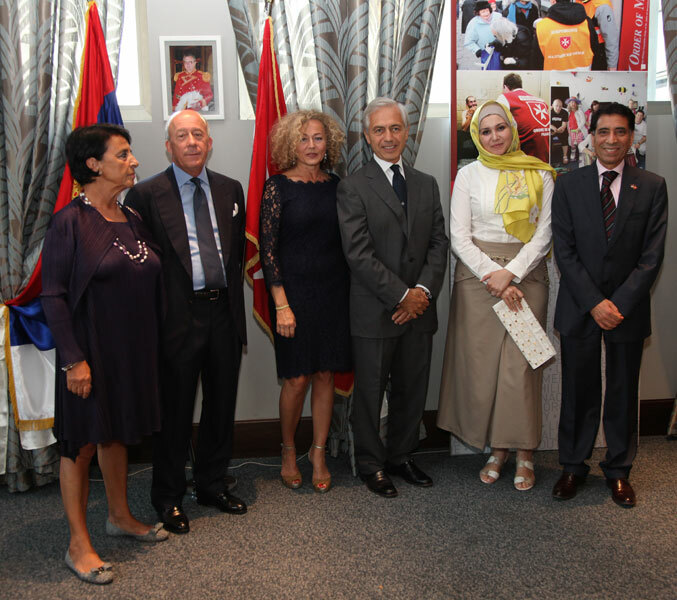 Mr. Abdellah Zegour , Ambassador of the Kingdom of Morocco, H.E. Mr. Harold Augustus Koko , Ambassador of the Federal Republic of Nigeria, Mrs. Hanna DALEWSKA-GREŃ First Counsellor, Embassy of the Republic of Poland, H.E. 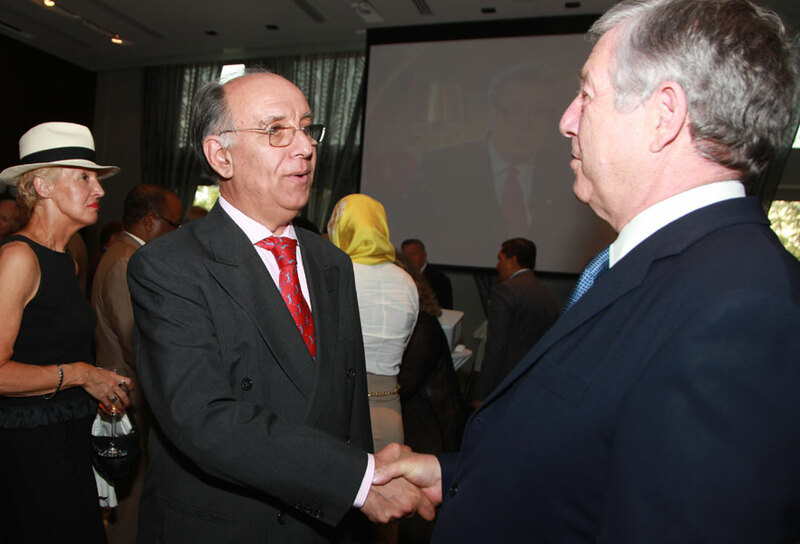 Mr. Augusto José Pestana Saraiva Peixoto, Ambassador of the Republic of Portugal, H.E. 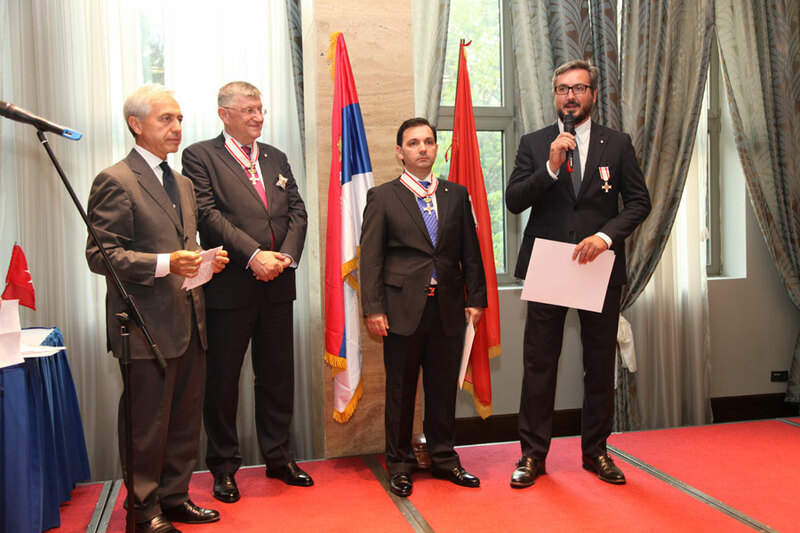 Mr. Ján Varšo, Ambassador of the Slovak Republic, H.E. Mr. 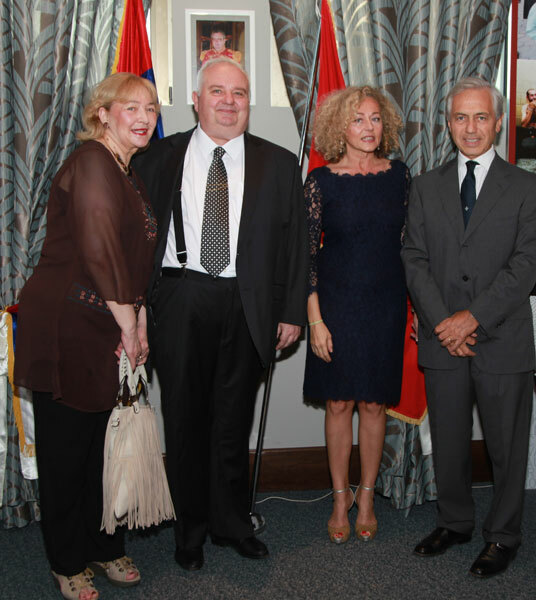 Franc But , Ambassador of the Republic of Slovenia, Dr. Dia Nader De El Andari, Embassy of the Bolivarian Republic of Venezuela and H.E. 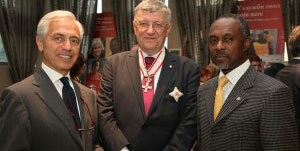 Mr Denis Keefe, Ambassador of Great Britain. 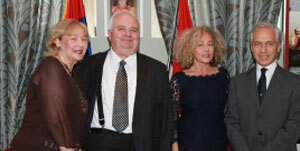 On behalf of UNICEF and UNHCR, the Directors for Serbia, Alix-Andre Michel Saint Lot and Eduardo Arboleda Sepulveda. 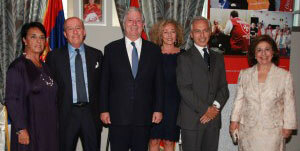 Also present were the representatives from the business world, culture and the arts. 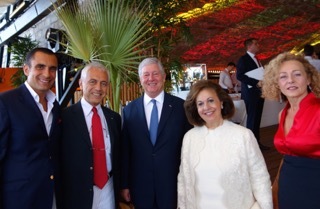 Among the many CEO’s, Dr. Andrea Simoncelli from Delta Generali, Banca Intesa Director for the Balkan aera Dr. Rosario Strano and the CEO for Belgrade Dr. Alessio Cioni. The proximity to the Universities was witnessed by the presence of prof. Slobodan Unković from Singidunum University, prof. Dejan Popović and prof. Miodrag Orlić, University of Law, Prof. Milan Skulic, University of Philosophy. 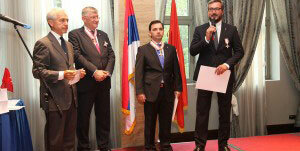 Among welcomed guests as well the Pink TV Group President Ivan Vlatkovic and its CEO Zeljko Mitrovic. 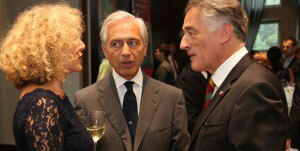 After the two National Anthems, Ambassador di Luca, delivered on behalf of H.R.H. 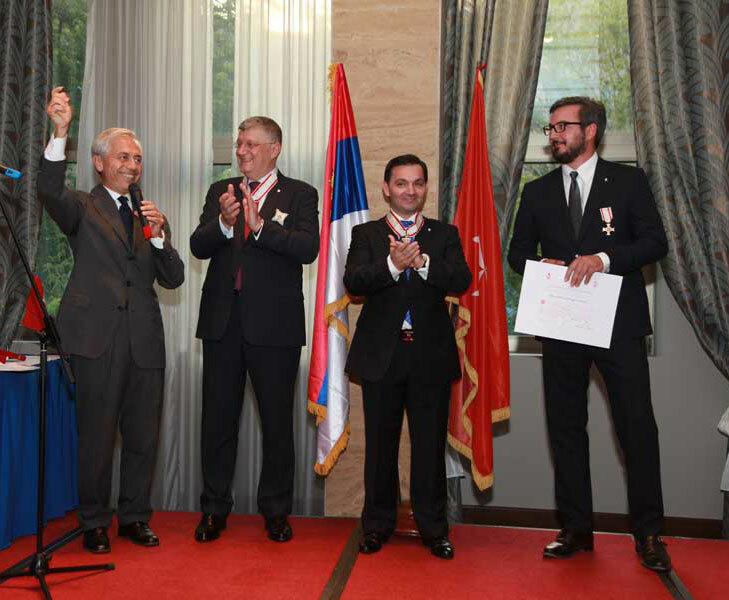 The Prince and Grand Master Fra ‘Matthew Festing, three Honours Merito Melitense to Prof. Dr. Oliver Antic, Prof. Dr. Vladimir Marinkovic and to Dr. Federico Bolondi. 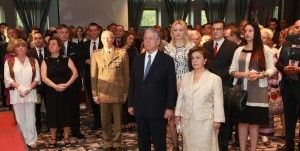 In a cordial atmosphere the evening ended with the words of Ambassador Alberto di Luca: “I raise my glass to the future of the people of Serbia, to which I wholeheartedly wish prosperity, well-being, and continued success, as our ardent desire, of the friendship and cooperation between the Order of Malta and the Republic of Serbia”. 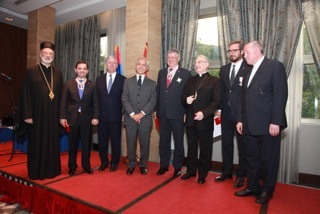 Presided over by the Grand Master Fra’ Matthew Festing, the Chapter General of the Sovereign Order of Malta was held in Rome on 30 and 31 May. 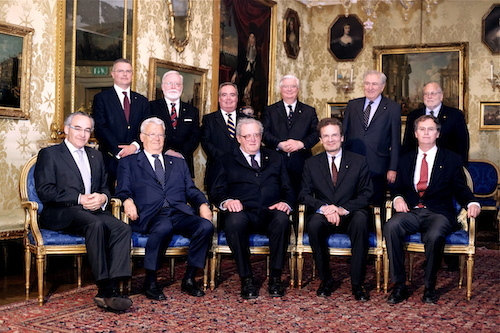 The Chapter General is convened every five years to elect the members of the Sovereign Council (the Government of the Order), the Government Council and the members of the Board of Auditors. Fra’ Ludwig Hoffmann von Rumerstein was elected as Grand Commander, Albrecht Freiherr von Boeselager was elected as Grand Chancellor, Head of the Executive Branch and Foreign Minister, whereas Dominique de la Rochefoucauld-Montbel and Janos von Esterhazy de Galantha, have been elected as Grand Hospitaller, Minister of Health and of International Cooperation, and as the Receiver of the Common Treasure respectively. 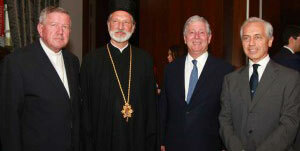 Sixty-one representatives of the Order participated in the Chapter General from five continents, including 28 of the Order’s religious, members of the executive branch and heads of the major national bodies.